Wheels pitches 10 of the biggest sellers in the medium-to-large car segment to see which is the best of the current crop. 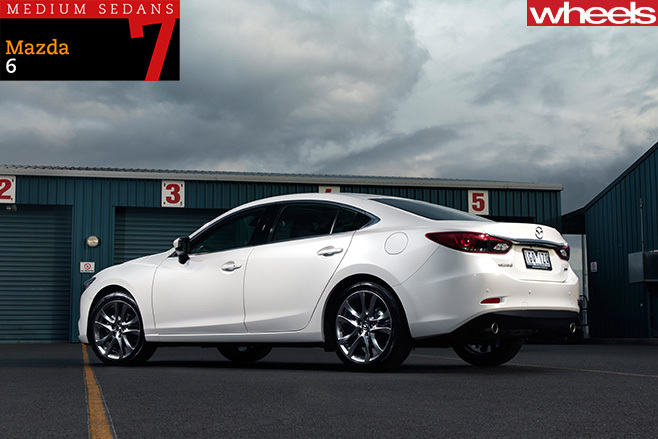 Here’s number 7, the Mazda 6 GT. Wheels pitches 10 of the biggest sellers in the medium-to-large car segment to see which is the best of the current crop. 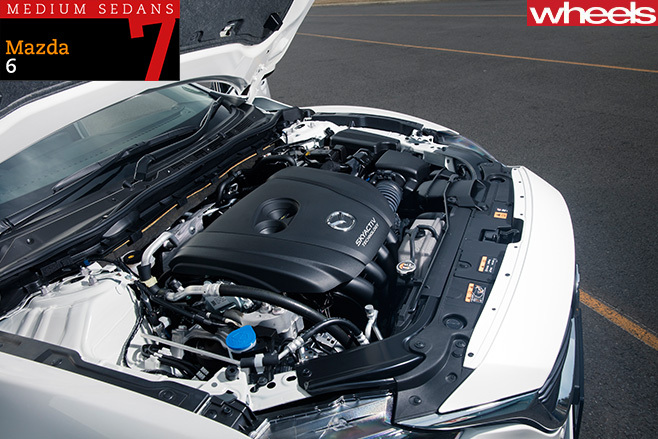 Here’s number 7, the Mazda 6. 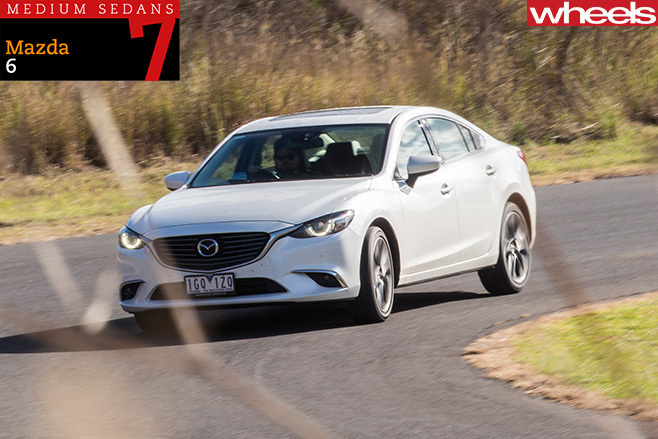 In the three-and-a-half years since the third-generation model arrived, it’s become clear that how highly we rate the Mazda 6 depends very much on which 6 it is that we’re talking about. The wagon, with its 80mm-shorter wheelbase, greater agility and sportier look, trumps the sedan. The 2.5-litre atmo petrol four – terrific as it is – can’t match the turbo-diesel’s broad, cultured delivery, or its efficiency. And while 2015’s facelift brought many improvements, models wearing 17-inch wheels and tyres remain more comfortable than those on 19s. From the outset, then, our GT petrol four-door on 19-inch wheels is seemingly the Mazda 6 in its least-convincing spec. But, given a price-point in the high-$30K/low-$40K region and a requirement for petrol sedans, this was the default choice for our Megatest. Urban impressions of the engine are of a rorty, vocal worker with surprising zest. Mazda’s 2.5-litre four-pot, like Subaru’s boxer, stays the atmo course, while the majority take the smaller-capacity turbo route. The 6 pulls heartily from low revs and develops a lovely rich note as revs rise into the mid-range, to the point you could almost be forgiven for thinking you’re in an old-school hot hatch. A bit gruntier than the Subaru, and a bit lighter, the result is more than noticeable on the road – at 7.7sec 0-100km/h and 5.1sec for the 80-120km/h bracket, the Mazda is pretty much on par with the sprightly turbocharged Passat. The SkyActiv-G engine does a lot with what it’s got, then, while delivering slightly disappointing mid-field economy to just pip the Subaru Liberty at 9.6L/100km. On smooth hot-mix, the Mazda handles obediently, with a dose of adjustability. It’s no Mondeo – like many, it lacks the Ford’s linearity and fluency – but it’s still a satisfying thing in which to hustle. On a bad back road, however, the 6’s chassis composure begins to unravel. Its ride becomes brittle (though extra occupants help calm it) and the long-standing Mazda bugbear of coarse-chip tyre drone and vibration quickly introduce themselves, along with wind rustle around the door frames, which make it tiring for longer runs. Throw bumpy corners into the equation and steering kickback corrupts feel. Front-seat ergonomics remain odd, too, with ultimate comfort remaining elusive no matter how much you fiddle with the seat and wheel. 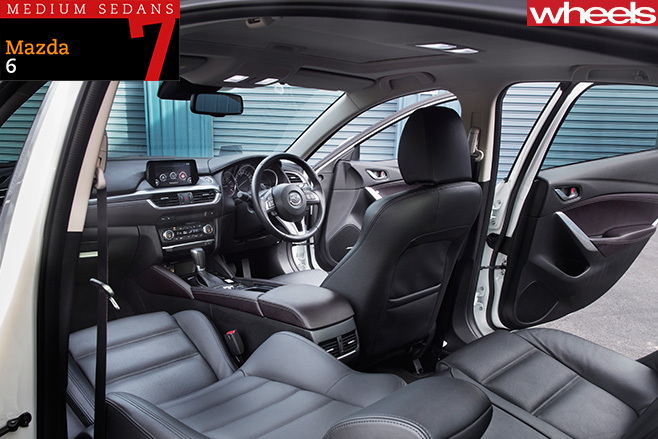 Yet in the back, aside from a flat cushion, it’s an accommodating place that offers a well-sited backrest, air-con vents, central armrest and padded outer armrests, cup and bottle-holders, a pair of map pockets, and Isofix points in the outer positions. Open roads reveal a lack of turbo-boosted flexibility and shove, but the atmo 2.5 still performs well, worked via responsive wheel paddles on twisty sections. 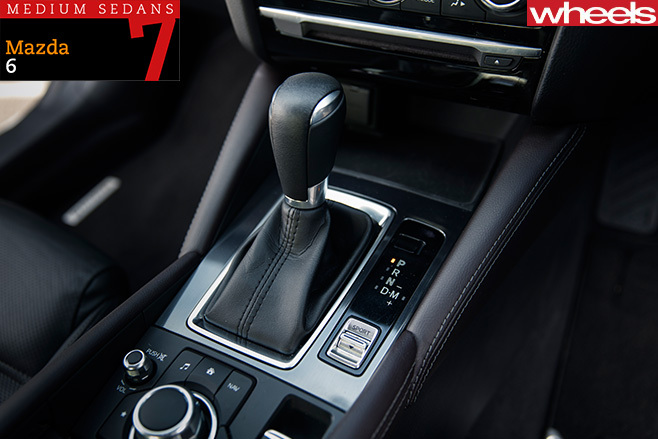 In fact, using the paddles is the only way to make consistently brisk progress because the six-speed auto is tiresomely fixated on maintaining upper ratios in Normal mode, yet is too rev-happy in Sport. A single, well-calibrated setting in between these extremes would be a major improvement. It’s very likely that a Touring diesel wagon would have excelled in almost every key area in which the petrol GT stumbled, nudging the likeable 6 much closer to the pointy end here. Provided you were happy to forgo a bit of spec, choosing this version would also save you around $1000. A system called ‘G-Vectoring Control’ is set to give the Mazda 6 heightened on-centre steering connection and turn-in response. It uses software to mimic the corner entry technique of a pro driver by trimming engine power (in just 50 milliseconds) to transfer weight to the nose on turn-in. Our first taste of the system (Wheels, August) suggested subtly improved connection, precision and driver satisfaction. A right-specced 6 with the vectoring chassis tickle might be the car to challenge our Megatest podium-getters. We’ll see GVC first on the Mazda 3 facelift in August before it’s progressively rolled out across the range.